One of the best ways to improve the appears of a mesh is to use something called Mesh Smoothing, or Smooth Shading as its called in Blender. In a nutshell, Mesh Smoothing changes the way surfaces behave when illuminated, suitably marked they appear facetted or smoothed next to neighboring faces. Mesh smoothing is particularly useful for round or curved surface. 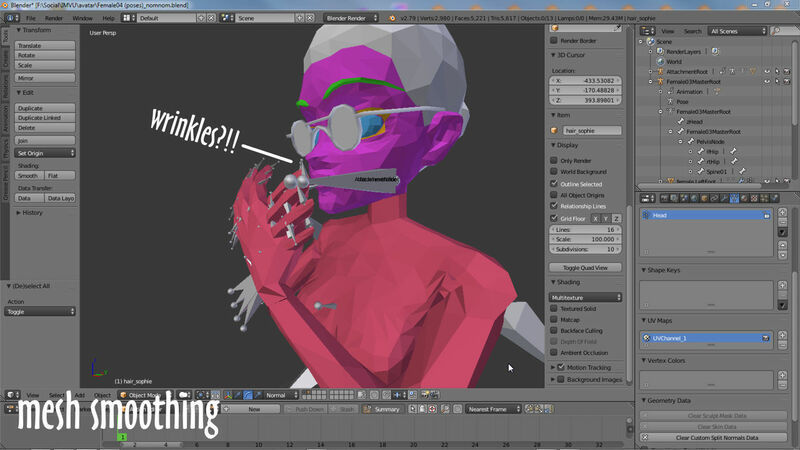 Mesh Smoothing, or Smooth Shading in Blender, changes the way surfaces behave when lit, causing hard or soft edges across an object. In Blender mesh smoothing is a Shading property available in the Tool Shelf. Here two global settings are provided; Smooth and Flat. 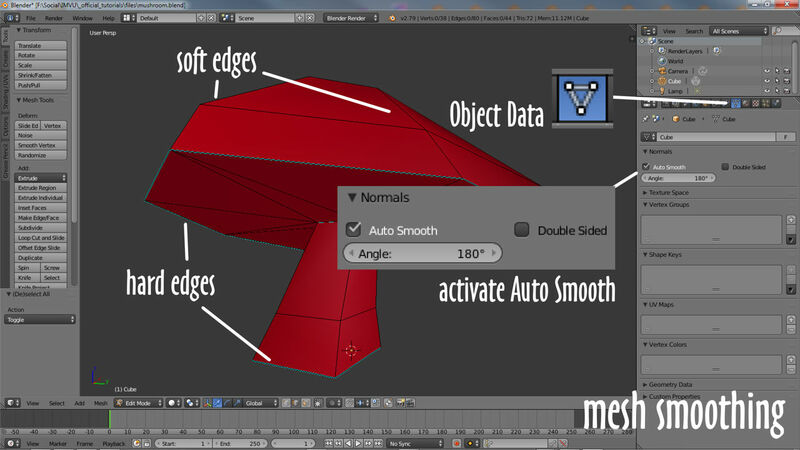 With Smooth assigned or active, the selected object will appear entirely smoothed and undefined. With Flat active the same object appears facetted. To assign, simply select an object and in the Tools tab of the Tools Shelf click the Smooth or Flat buttons. This assigns either/or property globally (equally to everything). Don’t eat these! 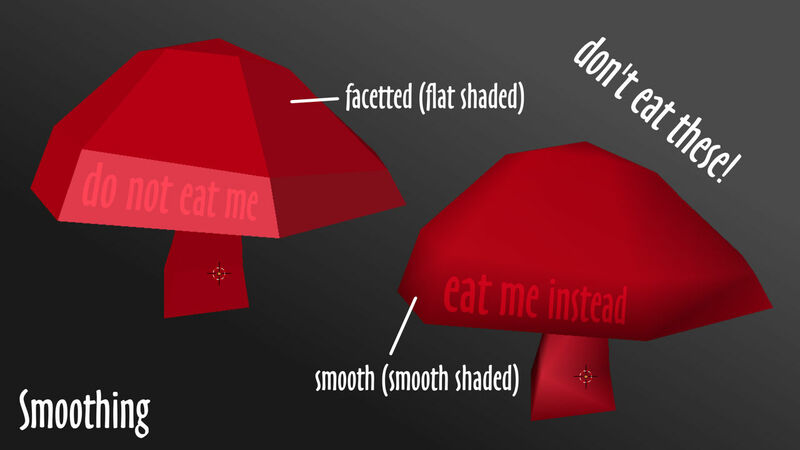 When enabled Smoothing makes objects look soft or mushy due to the way meshes shade (light and dark) in response to lighting – the mushroom on the left is Flat shaded (default), mushroom on the right is Smooth shaded. For most objects simply activating or assigning smoothing won’t produce the best visuals because the entire mesh is assigned the property. For better results smoothing needs to be controlled in some way so some sections of an object appear more defined than others. To do this in Blender specific edges are first selected (right-click, Shift+right-click etc.) and then marked or tagged with a special property called Sharp (Mesh » Edges » Mark Sharp) – edge colour changes to pale-blue indicating assignment of the property. 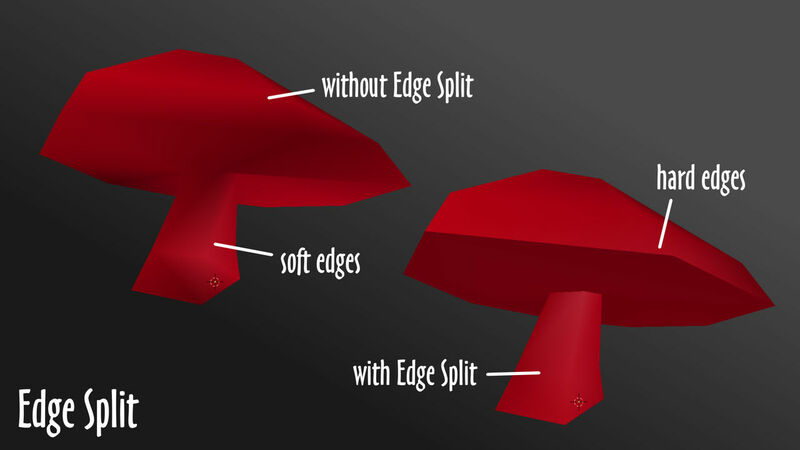 It’s generally a good idea to place at least some Sharp edges otherwise the mesh may appear incorrectly shaded in IMVU – mesh would be treated as being a single, unified surfaces expanse. To control smoothing specific edges (shown highlighted) need to be marked as Sharp so Blender knows to place a hard edge at these points. To see the effect once specific edges have been marked Sharp (select, Mesh » Edges » Mark Sharp), to see the result, in Object Data (Data) Properties enable the Auto Smooth option. This will ‘smooth’ the mesh based on the edges that have been marked and/or the Angle value (in ° degrees) that’s set – anything under the threshold is sharpened/given a hard/sharp edge. Once edges are marked, in Object Data properties activate Auto Smooth to see the effect. Or for even greater control over where sharp edges appear, once marked, in Modifiers Properties (wrench icon) select Edge Split to add an instance to the stack (panel) – this changes or ‘modifies’ the appearance of the mesh. 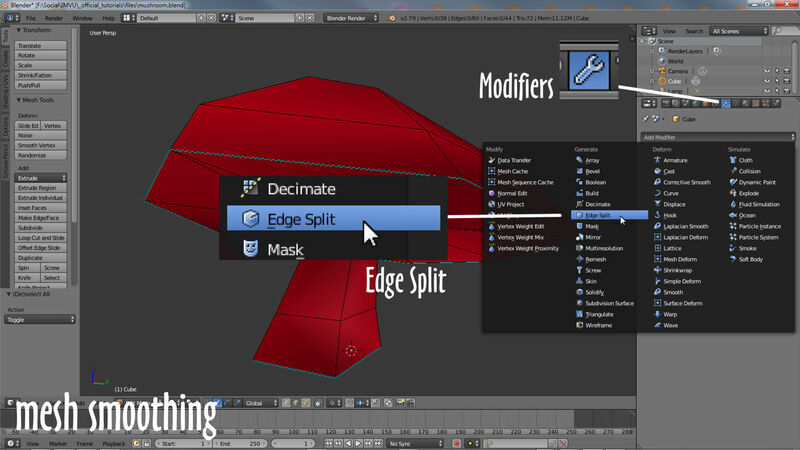 An alternative and more controllable way to enable smoothing is to use the Edge Split Modifier. 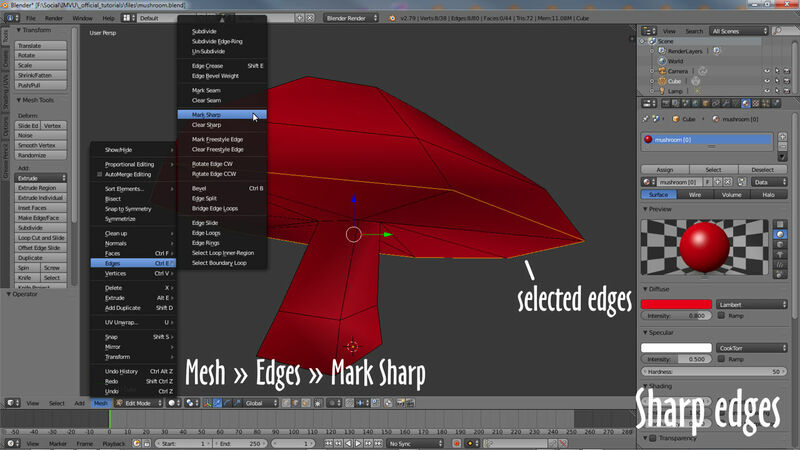 Of the two options available, Edge Angle and Sharp Edges, deactivate/disable Edge Angle leaving only Sharp Edges active, smoothing, the presence of hard edges on the mesh, will only occur where Mark Sharp has been used. Depending on where edges are marked as Sharp the end result is a mesh that emphasizes different areas of the object. Used appropriately Sharp edges and the Edge Split modifier help to better emphasise different areas of the mesh, preventing it from appearing undefined and mushy.